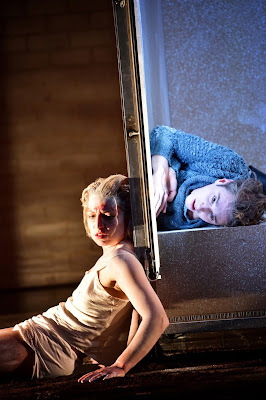 Willhelm Tell is a co-production between the Theater Basel and the Schauspiel Köln, directed by Stefan Bachmann. 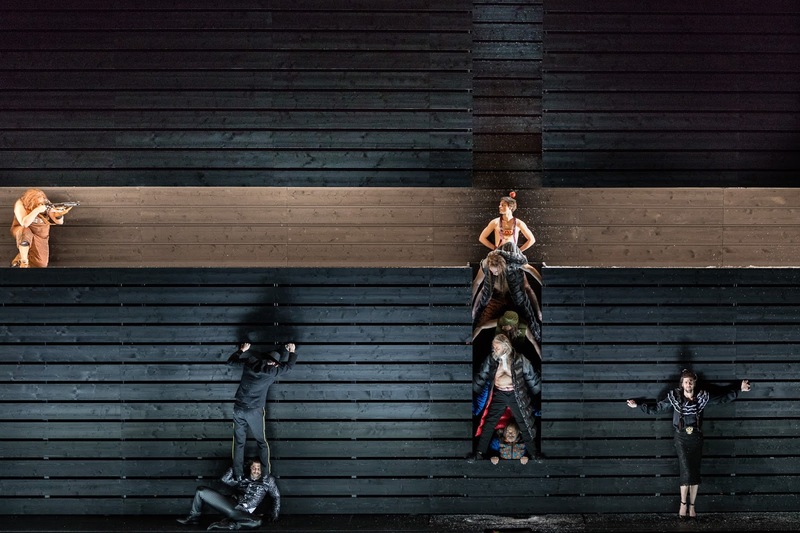 We all know the story of Willhelm Tell, but we have never seen it staged like in this production. The text is very close to Schiller's original but the way it is performed is completely different and very modern. The whole play is spoken simultaneously to different beats, which creates a captivating flow that made it hard for us to sit still. The stage never changes throughout the play, it is a wooden construction with one vertical and one horizontal passage where the action takes place. A play about independence, freedom and justice, about moral courage, cohesion and strong characters. 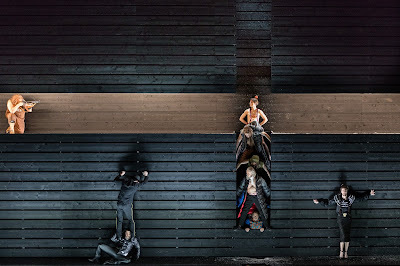 Stefan Bachmanns Willhelm Tell is a fantastic production with brilliant actors and an amazing concept we liked very much. The break of noon at the Theater Basel is a commissioned play by Anja Hilling after Paul Claudel. 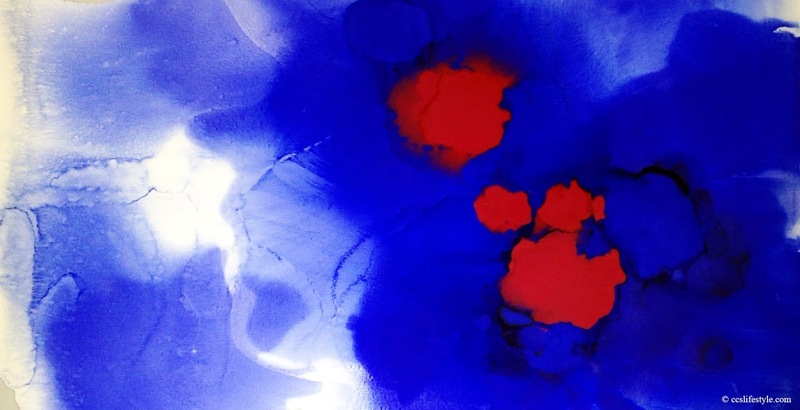 Directed by Julia Hölscher, the break of noon is a play about restlessness and constant self-questioning. Through three acts taking place in three different extreme situations (the first act on a ship to China, the second act in a cemetery in Hong Kong and the third act in a barricaded colonial house in the south of China), the four protagonists try to find their places in the world and define the relationships between each other. All these situations have something extreme and ultimate you can not escape from, which makes the play very captivating and tense, the dialogues between the four characters are partly provocative, partly questioning but always very straightforward and powerful. The play also addresses timeless elementary conflicts like the choice between career and family, exploring or settling down. The stage setting changes with every act and the light creates different atmospheres matching the different situations, sometimes narrowing, sometimes creating a feeling of endlessness on stage. We found the play thought provoking and the staging very artful. The Argan beauty Sheherazades dream bath is a wonderful bath salt with natural ingredients and free of artificial colorants or perfumes. It contains pure argan oil, leaving the skin nourished and soft. We like the enchanting oriental scent of amber and musk a lot and it creates an incredibly relaxing bathing experience. The argan oil moisturizes the skin deeply, which is especially important during the colder days. 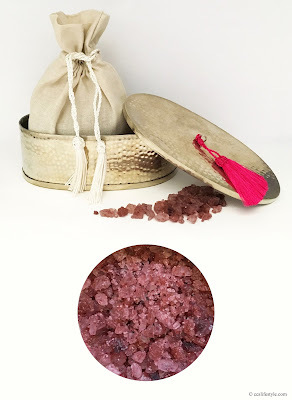 The bathing comes lovingly wrapped in a little bag in a pretty silver box with the tassels that are typical for the argan beauty products. 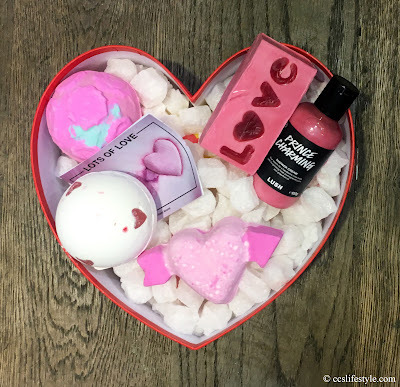 With the wonderful LUSH Valentines Day products, every day can be a Valentines Day. After the Prince Charming Shower Gel and the Lover Lamp Bath Bomb from last year, we have chosen three more products we really liked from the collection. 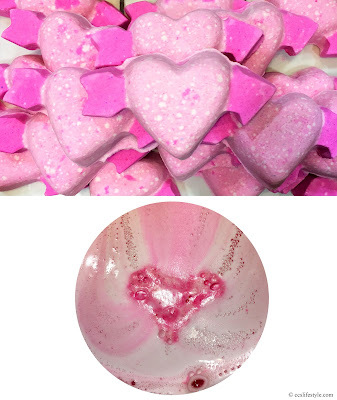 The cupid bath bomb unites the scents of rose and bergamot and creates a wonderful floral and slightly citrusy scent. It turns the bath water in beautiful shades of pink and leaves the skin soft and soothed. The two hearts beating as one bath melt with the sensual scent of Ylang Ylang and rose oils, melt slowly in the hot bath water and cover the skin gently with hydrating almond oil and rich argan oil. It creates a wonderfully relaxing bathing experience and you can use the bath melt for more than one bath. 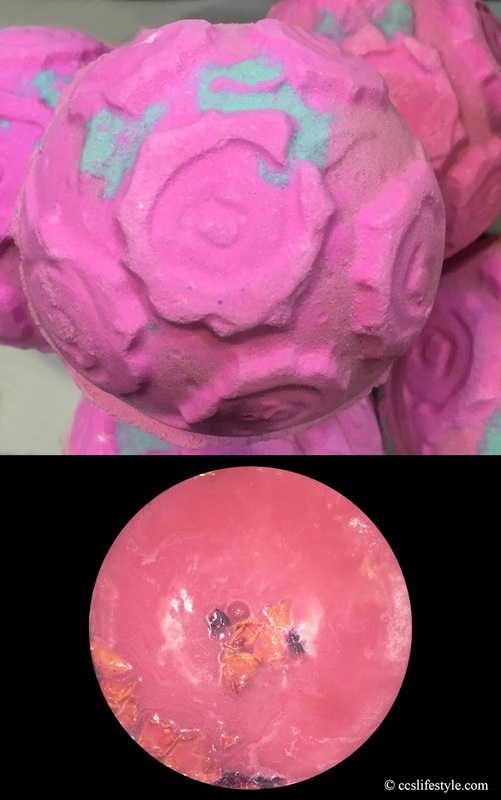 The Rose Bombshell bath bomb has an incredibly intense scent of roses we absolutely love and that lingers on your skin for a very long time after the bath. When you drop it into the bath tub after a little while beautiful rose petals appear in the bath water while turning the water into a strong pink. All of these products are vegan. 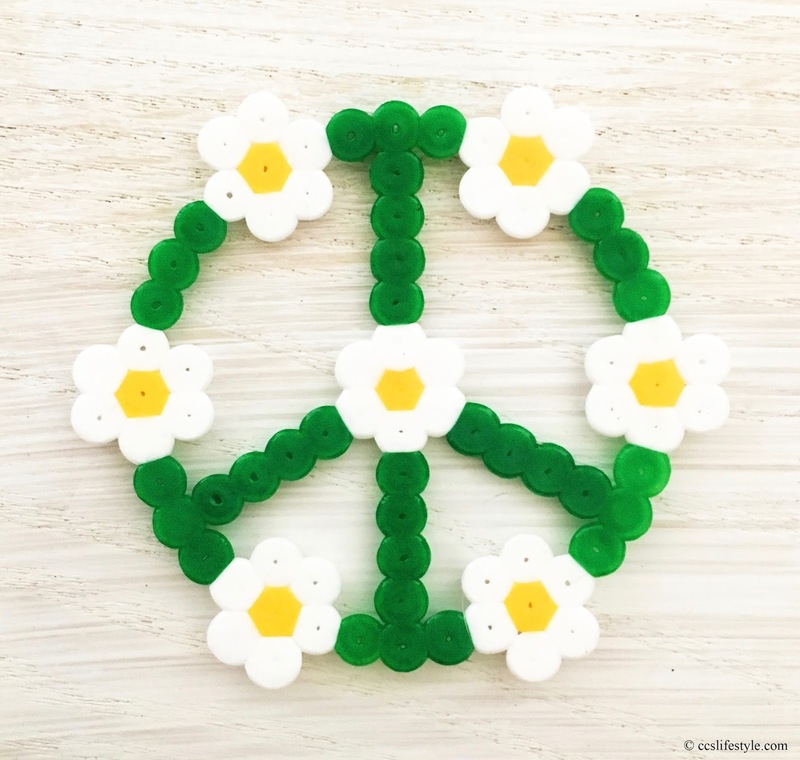 Waste is LUSH's big topic for the year 2017, as we are already used to the LUSH bath bombs or massage bars and many more products are sold in the shops without individual packaging. 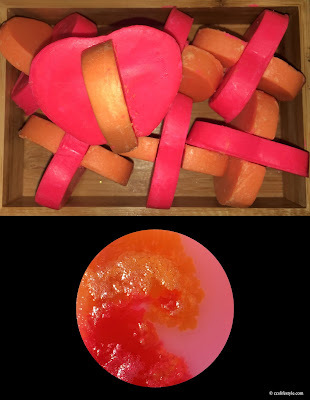 Lush offers a variety of products that do not produce any waste as an alternative to the products we are used to, like shampoo bars as an alternative to shampoo in a bottle. Not only do they reduce our waste but also they are very long lasting, 1 shampoo bar lasts as long as three bottles of liqued shampoo. During the year LUSH will start and support many different projects around the topic of waste and therefore also sustainability, which we think is fantastic as these are major topics and taking care for our environment and the planet is something that is also very important to us.